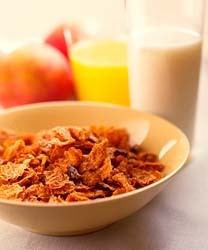 We all understand that eating bran is a great way to add some much-needed fiber into our daily diets but anyone who thought they had to suffer through the same bowl of bran cereal and cold milk each morning is in for a brantastic surprise! Not only does Kellogg�s All-Bran cereal come in a satisfying array of choices, from All-Bran Extra Fiber to All-Bran Yogurt Bites, there are endless recipes to help incorporate that daily serving of fiber-filled bran in tasty ways; and not just for breakfast! How about switching out that bowl of cold cereal in the morning for some incredible banana pancakes, or shall we say�brancakes. In a small bowl, beat egg whites until stiff but not dry. In another bowl, beat cottage cheese, egg and egg yolks until nearly smooth. Gradually beat in flour and bran cereal. Stir in diced banana. Fold in egg whites. Using about � cup batter for each pancake, cook on greased griddle preheated to 375 F, turning once. Serve with butter, bananas and syrup. The crunch of bran cereal truly compliments this fresh, fruity salad. It is the ideal light and crunchy lunch for a hot summer day. In a large bowl, toss together broccoli, fruit and onion. In a small bowl, stir together salad dressing, orange juice, orange peel and pepper sauce. Drizzle over broccoli mixture. Toss to coat. Cover and refrigerate for 30 minutes to 2 hours. When ready to serve, gently stir in cereal. For a healthy, fiber-filled dinner, try this delicious bran-baked fish. In a food processor or blender, crush cereal into fine crumbs. Add garlic powder, basil, lemon peel, cheese and margarine. Place in shallow pan or plate. Set aside. In small bowl, combine yogurt, salt, pepper, lemon juice and ketchup. Coat fish with yogurt mixture then, cereal mixture, covering completely. Place in a single layer on a shallow baking pan coated with cooking spray or lined with foil. Bake at 375 F for about 10 minutes. Turn fish. Bake 10 minutes longer or until fish flakes. Serve hot. Garnish with parsley. Let�s not forget dessert (I know I certainly never could), These tempting cookies are classic chocolate chip with a healthy little twist. Sift together flour, soda and salt. Set aside. Enjoy the benefits of bran all day long!